For five consecutive years, the seniors in the interior design program from the Department of Family and Consumer Sciences at Sam Houston State University have assisted with the preparation of the Conroe Show House. The Conroe Show House 2003, which benefits the Montgomery County Performing Arts Society, is now open through March 31. Working with Conroe builder Willie Anderson and designer liaison Elizabeth Pease of the Performing Arts Society, Laura Burleson and 16 of her students took on the job of decorating two guest bedrooms and a bath. The students were required to work as a team to develop and agree upon a design idea. They also assisted in locating resources that could be borrowed to display the spaces, and they were present for deliveries and installations. 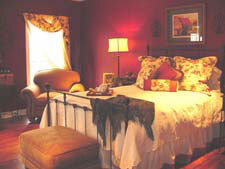 One of the bedrooms was painted a Ralph Lauren "Sand Pail Red" and was developed with a relaxed country theme taken from the orchard area of New England. The color scheme pulls together dark reds and earth tones accented by cream damask and black cabinets. The fabrics in the custom draperies and pillows contain various fruits and butterflies enhancing the orchard theme. An antique styled iron bed and dress on loan from Stephen's Interiors in Conroe complement the two large lounge chairs borrowed from Ward Furniture and Flooring in Huntsville. A set of 1930s metal trucks and a carved chest on a stand were borrowed from Coelacanth Antiques and Gifts in Huntsville. Floral arrangements were borrowed from Henny Penny in Navasota. 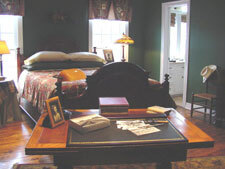 The other bedroom was painted in Ralph Lauren's "Awning Green" and reflects the simple comforts of a New England hunt. A classical designed bed loaned by Ward Furniture and Flooring reflects the days of early morning preparation for the hunt, as well as a love of horses in Texas. A custom duvet and boxed valances are from a library and horse patterned fabric accented with a small check. Completing the space is an antique oak writing desk resting on a wool area rug from Stephen's Interiors to soften the rustic solid pine floors. The bathroom was created with a masculine presence as seen in the classical elements and dark wood tones with a pyramid towel stand from Pier 1. The custom window treatment reflects geometric shapes in classic Roman shades. However, the female guest is also taken into consideration with the inclusion of a soft vanity stool from Stephen's Interiors. Towels and floor runners pull together cream, cinnamon and olive tones. New England accessories include a wood goose and woven baskets. The senior interior design students who worked on this year's project include: Tayton Billings, Tanya Craddock, Jennifer Greeley, Emma Hall, Anorea Hill, Valerie Johnson, Jessica Love, Christina Marple, Kelly Ngo, Stephanie Noman, Barbara Oldham, Lindsay Owrey, Katharyn Prescott, Donna Reynolds, Sheryl Ruffner and Cindy Vodehnal. This year's show house is located at 12533 Longmire Lakeview West on the shores of Lake Conroe. The house is open 10 a.m. to 5 p.m. Tuesdays through Saturdays, and 1 to 5 p.m. on Sundays. It is closed on Mondays. A light salad lunch and dessert are offered in the tearoom daily. Tickets can be purchased at the door for $10.